A powerful spray that provides nourishment and disinfects the hoof. 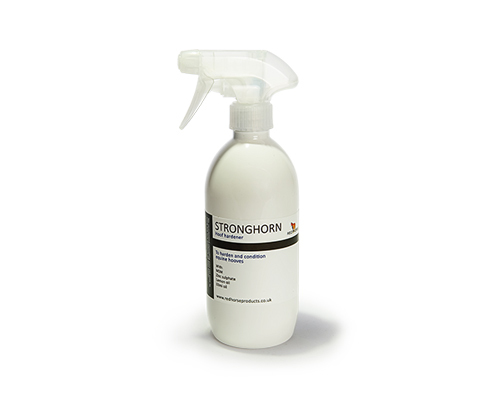 Stronghorn contains Zinc Sulphate, MSM, Lemon oil, Elemi oil and Citric acid. Directions: Clean the hoof. Spray product onto the underside of hoof and around any nail clenches, avoiding the frog unless it is very soft. Apply daily until improvement is shown and then phase to weekly applications over time. For best results allow to dry prior to work or turnout.